Burnout is described as a state of chronic stress that leads to physical, mental and emotional exhaustion, loss of energy, enthusiasm and confidence. It is not necessarily caused simply by working too much, but is often a combination of little or no control of your work situation, high demands at home and lack of social support. 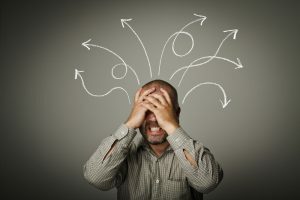 It is not clear why some people are more prone to be afflicted by burnout, but research (1) indicates that it is a combination of different factors such as personal traits, sensitivity to changes, avoidance of dealing with problems, a disposition for anxiety, having high demands one oneself, difficulties saying no, difficulties with delegating, and a deep belief that one cannot influence one’s situation. Not enough time for rest and recovery: Everyone needs a chance to rest and regain their strengths to take on another day of work and home life. Not only the body, but also the brain, needs restoration to be able to learn new things and to preserve its already acquired knowledge. Lack of meaningful rewards: Getting recognition for your efforts in school, at work or at home, is vital for your psychological well-being. Social isolation: Isolating oneself is a common coping strategy when feeling overwhelmed. But this actually makes you more likely to experience stress and psychological distress. Lack of control: Without control, for instance having the opportunity to influence your work schedule or your tasks, the risk for burnout increases. Too high demands: High demands at work can often be rewarding and developing, but can sometimes get overwhelming. Is it your work place that is making you ill? According to The High Demand-Low Control Model, which was developed by Robert Karasek in the 1970’s, the ratio between the experienced control and the experienced demands of an employee is crucial to whether the job will lead to negative or positive stress. The jobs where the employees are at the greatest risk of burn-out are the so called high strain jobs, where the employee experiences high demands but low control (3,4). If you are experiencing these symptoms, or if you believe that you are already in a state of burnout, it is time to seek help. You can take help by a professional therapist to make what could be life-changing decisions.